Just got this mill second-hand, it seems to work fine, but I don't know how it was treated by its previous owner(s), and I'd like to do any preventive maintenance it may need. Is anyone familiar enough with these to offer me some tips? Also, I saw that Retsel sells a crank handle for when the power goes out. I'm wondering where I would attach such a handle. I assume I would have to remove the motor. Would I need to remove the 4 hex nuts behind the motor? I have the Retsel Mil-Rite. Maintenance required is minimal. All I do for mine is to brush out the remainders after a milling session and reassemble. If I were grinding daily, I probably wouldn't even do that. If you have stones as opposed to steel burrs, avoid grinding anything with much moisture (above 10%) 'cause it will gum up the stones (they say), which is called 'glazing'. The manual says do not use the stones to grind damp grain, meat, vegetables, wood, stone, salt, popcorn, or rice. In another place in the manual, it says that you can grind rice to remove glaze, so the rice advice is inconsistent. Do you have stones, or steel burrs? Or both? Do not immerse stones in liquid. For household use, the Mil-Rite is lubricated for life; no additional lube required. As far as the crank handle, which I bought, on the Mil-Rite, the front-most casting has a relief that accommodates the handle. I remove the adjustment knob and screw, put the end of the crank in place, reinsert the screw and tighten. I do not see a similar groove in your picture. Maybe the groove is there but I can't see it, or the Mil-Master has a crank of a totally different design, or there is no crank for the Mil-Master. Thanks for the fast reply, Miles. It has steel burrs. I would have preferred stone, but I don't expect to ever find them used, and I won't risk ordering them from Retsel. The steel ones seem to give fine enough flour from the handful of wheat I threw in to test it. I took the screws out of the faceplate to see if I could take a look behind it, I was looking for dried out greese, but when I cracked it open a tiny bit I noticed some liquid grease, so I closed it back up satisfied that it's still lubricated. On the Mil-Rite, the motor can be removed by removing the four long screws from the cast metal back plate of the motor. 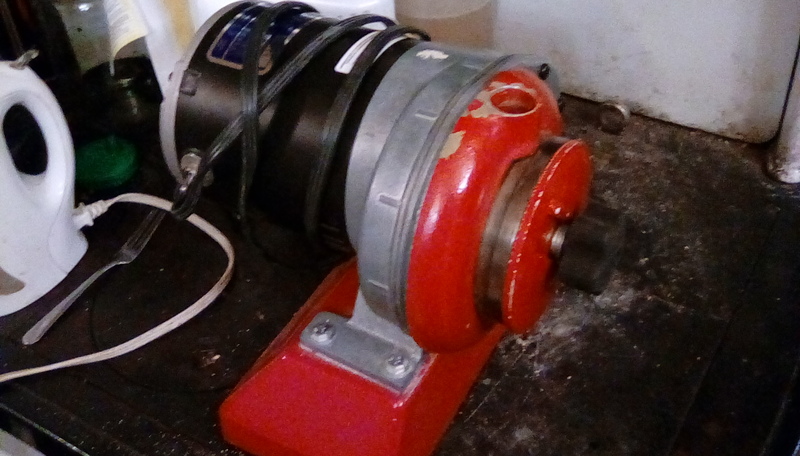 Pull off the stator, and then pull the rotor with its helical gear free from the gearbox. To reassemble, reverse the steps. I never opened my gearbox, but I pulled the stator and rotor many times in the course of my repair job. 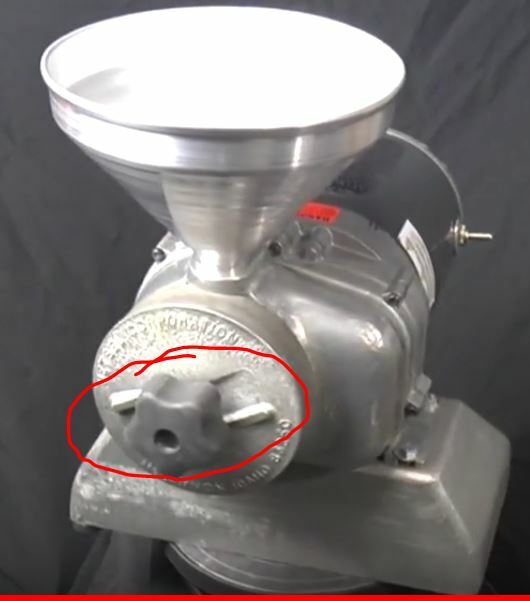 If I were planning to grind using the handle, I would first either clamp or bolt the base to something solid. And expect to work hard and long cranking the mill. Should be a workout. the instructions say to remove the allen screws and the front cover, then remove the reduction gear. It's not necessary to remove the motor. Bit of a hassle either way. But the one recommended in the instructions does sound better. My model won't let you remove the cover unless you take the motor off, because there's a bump on the shaft that the cover can't slide over, so the cover must come off on the motor's side. And the screws aren't Allen on this one, but six-pointed stars. It looks like non-electric operation is meant for the long term. The augur drive shaft on my model has a key for positive drive. The key on mine is a friction fit, but should be removable. Not sure about yours. I think the six-pointed star heads are called Torx. Torx wrenches and bits are readily available at hardware stores. do say Allen, but mine are Torx as well. Key pries up. With 7 long machine screws, it takes a while. Another issue is remounting the mill to something that won't move. It's way too much trouble if your motor is working. The key will pry out a bit with a flat scewdriver, but I can't get it out without prying on the other side near the faceplate, and I dont have a tool to do it. Did it come with some kind of tool for this? Ok I got it out with a lot of prying. Now I can clean this thing up properly. Crank operation doesn't seem like a good idea long term as there is no bearing absorbing friction without the motor shaft turning.